Samhain is the time of year when many members of the Pagan community celebrate the cycle of life and death. This Sabbat is about the end of the harvest, the calling of the spirits, and the changing aspects of the god and goddess. Try some or even all of these ideas—obviously, space may be a limiting factor for some, but use what calls to you most. The leaves have fallen, and most are on the ground. This is a time when the earth is going dark, so reflect the colors of late autumn in your altar decorations. Use rich, deep colors like purples, burgundies, and black, as well as harvest shades like gold and orange. Cover your altar with dark cloths, welcoming the coming darker nights. Add candles in deep, rich colors, or consider adding an ethereal contrasting touch with white or silver. Samhain is the time of the dying of the crops and of life itself. Add skulls, skeletons, grave rubbings or ghosts to your altar. Death itself is often portrayed carrying a scythe, so if you've got one of those handy, you can display that on your altar as well. 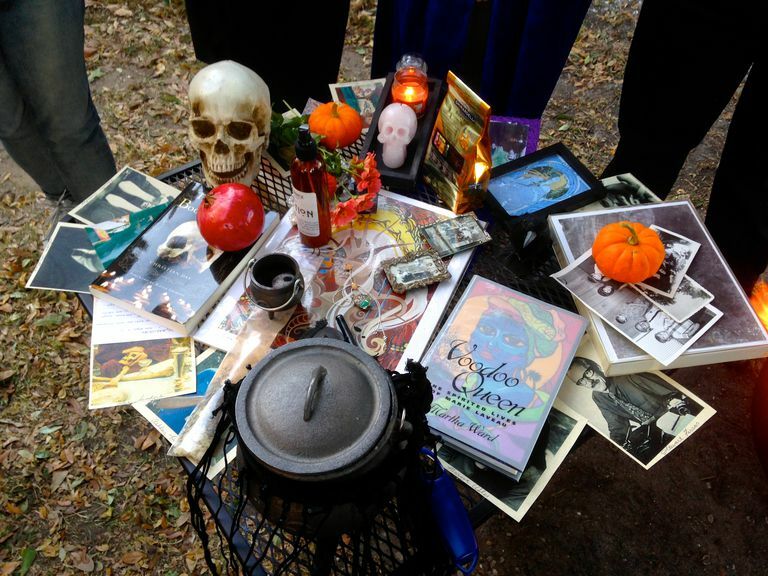 Some people choose to add representations of their ancestors to their Samhain altar—you can certainly do this, or you can create a separate ancestor shrine. In addition to symbols of death, cover your Samhain altar with the products of your final harvest. Add a basket of apples, pumpkins, squash, or root vegetables. Fill a cornucopia and add it to your table. If you live in an agricultural area, visit farmer's markets to gather up straw, sheaves of wheat, corn shucks, and even sickles or other harvest tools. If you planted a herb garden this year, use seasonally appropriate herbs on your altar, such as rosemary to remember your ancestors, mugwort for divination, or yew branches, which are commonly associated with mortality. If you're considering doing a bit of Samhain divination—and many of us do—add your divination tools to your altar for the season. Add a scrying mirror, your favorite deck of Tarot cards, or a pendulum to use in rituals related to divination at Samhain. If you do any kind of spirit communication work, this is a great time of year to reconsecrate them prior to use, and give them a bit of a magical boost. "I talk to my ancestors all year long, but at Samhain, I do a special ritual in which I speak to them every day for the entire month of October. I keep my scrying mirror and my pendulum on my altar for the entire month, and work with them each day, adding layer of layer of magic. By the time Samhain rolls around on the 31st, I've got a good thirty days of magical energy built up, and I usually end up getting some really strong and powerful messages from my departed dead when I do the final part of the ritual on the last day of the month."